Aung San Suu Kyi has denied the ethnic cleansing of Myanmar’s Muslim minority, speaking to the BBC after the UN rights council agreed to investigate allegations against the army. Every year, Myanmar spends over US$600 million on medical expenses overseas, according to Yangon region chief minister Phyo Min Thein on March 2. Myanmar may be struggling to organize systematic elections but the country has certainly done well when it comes to providing a method for the blind to vote. ccording to the 2017 Union Budget Law, K722 million has been allocated for Yangon and Mandalay electricity corporations – K529 million will go to the Yangon Electricity Supply Corporation (YESC) and Mandalay Electricity Supply Corporation (MESC) will receive the rest, K243 million. Both are state-owned organisations under the Ministry of Electricity and Energy. Vietnam’s Dragon Capital Group and Myanmar’s Ruby Hill Financial on Wednesday signed a deal to set up a joint venture that will provide loan products and services to the burgeoning workforce driving Myanmar’s rapid economic development. The Central Bank of Myanmar has released the rules for loan reporting which will enable domestic industries and small- and medium-sized enterprises to get bank loans. Property developer Shwe Taung Real Estate has signed an agreement with AYA Bank to provide mortgag­es for two high-end condo projects in Yangon. When the National League for Democracy took power in Myanmar last year it inherited one of the world’s fastest growing economies, but one still tangled in an arcane web of rules and regulations and in desperate need of modernization. Yangon’s munici­pal authorities are planning to invite bids from companies to run 43 state-owned enter­prises in the hope of mak­ing them more efficient, government media has reported. Dai-ichi Life Insurance has opened a representative office in Myanmar, as it looks to increase its foothold in the rapidly developing Southeast Asian insurance market. A 200-year old historical mosque in Buthidaung Township was bulldozed by the Myanmar military on April 3, 2017. Myanmar traditional Thingyan festival, one of the Myanmar 12-season festivals is coming soon, so Myanmar Police Force is performing tasks of reducing crimes, anti-drug suppression for the people to merrily participate during the festival and arrangements for people to safely travel in Thingyan period. 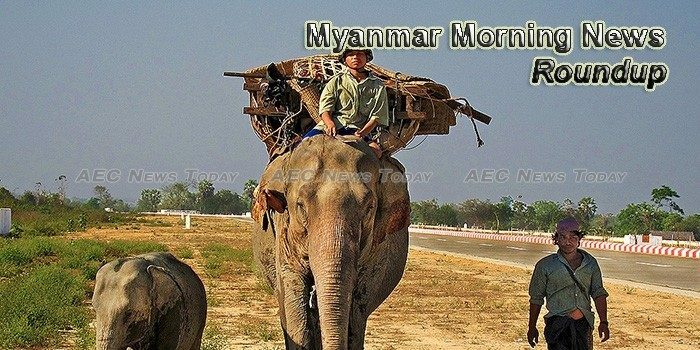 The Ministry of Electricity and Energy says it has proposed wind power plant projects in Chin, Rakhine and Ayeyawady. A committee chaired by State Counsellor Daw Aung San Suu Kyi yesterday discussed plans recommended by the commission headed by former UN head Dr. Kofi Annan. Although dried fish sell well starting in April, dried fish businessmen are faced with the problem of scarcity of dried fish supply, thereby having a need to suspend their business, according to sellers. The minister for social welfare, relief and resettlement says his ministry is carrying out research to help children with autism. SINCE early April, a project to install new lamp posts around the famous Mandalay moat has been implemented by Mandalay City Development Committee, one of its members said. The Myanmar government announced yesterday that it will spend US$6 million on the eradication of landmines and unexploded ordnance in Shan State, Kachin State, Kayin State, and Taninthayi Region. On April 10, 2016, diving enthusiast Thanda Ko Gyi set off for her third visit to The Nursery – a dive site off the coast of Kawthaung, near an obscure islet called Sloop Rock in the Myeik Archipelago. She was excited.